Much was made in Ireland, this morning, of the news that Dublin had rated highly in the annual Mercer Quality of Living Survey. This survey is carried out to provide some guidance for companies who are expatriating staff in terms of cost of living, suitable salaries for staff being relocated, and related matters. I have generally relocated myself so this is not something I have ever worried about but I had a look at the reports anyway. Dublin came in joint 34th place with Boston. This placed it higher than London and New York, and depending on which reports you read, outranking either London or New York was the hook most of the media went with. You can, with a little cooperating with Mercer, have a look at the data by clicking on “See Full List” on this page. So I did that because I wanted to have a closer look at the list and perhaps think a little more about whether, in fact, 34th place was good for Dublin or not. The only other Irish city on the list was Belfast and it came in at 63rd place. One of the single most interesting things that struck me about the top end of the list was the prevalence of German speaking cities. The highest ranked English speaking city is Auckland. There are only two other English speaking cities in the top ten, namely Vancouver and Sydney which squeaks in at 10. Five cities are German speaking and of those five, three are in Germany and Switzerland. No other country has more than one city in the top 10. Even if you stretch that out to the top 20 cities, Germany is still looking good. Basically, a quarter of the top 20 cities ranked by quality of living, are in Germany. 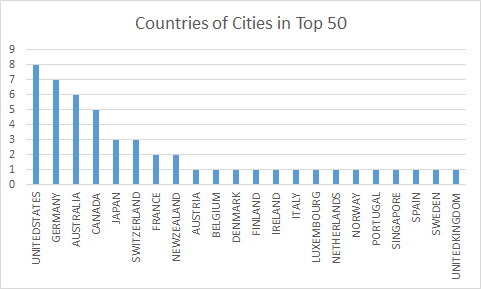 After that, if you stretch it out to include the top 50, the US squeezes in 8 cities. Germany still has 7. Australia has 6 which has to include pretty much all their major cities when you think about it. 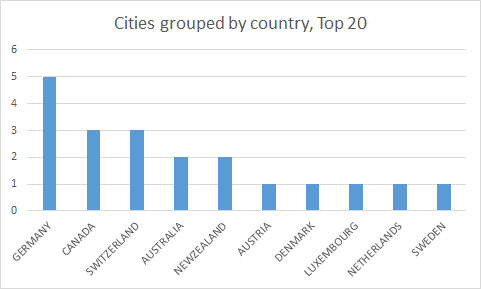 Once I was done being surprised at the prevalence of German cities in the top ten, and Australian cities in the top 50, the other thing which caught my interest was that realistically, none of the top ranked cities were particularly big. Here’s how they rank, left to right, in terms of population. and here’s how they rank, left to right, in terms of population density. There is a point to be noted about the population figures. If you look up population figures for most of these cities, you will find a number of figures, namely the figures for the city’s administrative area, and a metropolitan area figure. Taking Paris as an example, its population is 2.273 million inhabitants. The Paris metropolitan area, however, includes around 10 million people. For Tokyo, the difference is even more extreme: its population is given as around 13 million inhabitants; its metro area as 35 million. That being said, Paris and Tokyo are two of only 6 cities in the top fifty cities in this ranking whose populations exceed two million. After you come to terms with the idea that the best quality of living standards are basically in Germanic speaking countries, the next point to be picked up is that the best quality of living is in comparatively low population cities. The highest ranked city with a population greater than 2 million is Sydney which comes in at 10th place; the next highest is Melbourne. An interesting feature about Sydney, and Melbourne, and in fact, other English speaking new world cities (so Auckland, Ottowa and Brisbane as well) is compared to most of the other cities around them in the rankings, they have very low population densities. In terms of population densities, the three high hitters are Geneva, Paris which is way, way out in front in terms of population density, and Barcelona. So while you could suggest that there is a quality of living premium to be gained from living in comparatively small cities by population, the same pattern doesn’t exist in terms of population density. The vast majority of cities come in with a population density below 5000 inhabitants per square kilometre and above 1000. There are notable outliers either side of that band. All six Australian cities come in below 500 inhabitants per square kilometre including both Sydney and Melbourne, the two biggest Australian cities featuring in the list. What I do not have access to at this point is a detailed description of the features on which this ranking is calculated and that is a pity as I would be interested to see what those features were, and how weighted they were, and more to the point, whether all of them were necessary. I would also be interested to see on what basis cities were selected for review. The populations for Bern and Geneva, for example, are below 200,000. The lowest ranked city is Baghdad. Manchester does not feature which is surprising bearing in mind that Aberdeen does and it has less than half the population. Of the five UK cities in the list as a whole (not just the top 50), two are in Scotland. Only two cities from France feature. It is hard to argue that quality of living wise, Nice comes in somewhere below Baghdad. It is clear that the choice of cities is not on the basis of population but given Mercer’s primary business, it may well be in terms of the cities they get inquiries about. Connection wise, Dublin is well connected with most of Europe and some key locations in North America. Culturally, it is reasonably well served, if not as well as some of the other cities on the list. Shopping wise it isn’t terrible. But then, this is true of cities ranked more highly on the list, like Brussels in 23rd place. Admittedly, accommodation and public transport, in my view, almost certainly should rate Brussels higher than Dublin. If I were somewhere in Dublin City Council where policies get made and implemented, what would I want to do with this, if anything? Is it something useful to have under random news or is there anything to be learned. Given the audience of Mercer reports, ie, companies relocating staff, and Ireland’s heavy dependency on foreign direct investment, is there anything to be noted here?